Ven. Samten met Ven. Chodron in 1996 when the future Ven. Chonyi, took the future Ven. Samten to a Dharma talk at Dharma Friendship Foundation in Seattle. The talk on the kindness of others and the way it was presented is deeply etched in her mind. Four Cloud Mountain retreats with Ven. 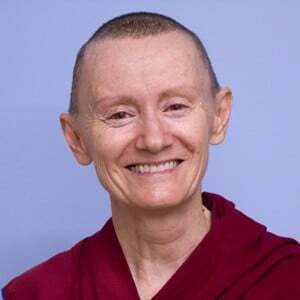 Chodron, eight months in India and Nepal studying the Dharma, one month of offering service at Sravasti Abbey, and a two month retreat at the Abbey in 1998 fueled the fire to ordain on August 26, 2010. See photos of her ordination. Ven. Samten’s full ordination took place in Taiwan in March 2012, when she became the Abbey’s sixth bhikshuni. See photos of her full ordination. Right after finishing a Bachelor of Music degree, Ven. Samten moved to Edmonton, Canada to pursue training as a corporeal mime artist. Five years later, a return to university to obtain a Bachelor of Education degree opened the door to becoming a music teacher for the Edmonton Public School board. Concurrently, Ven. Samten became a founding member and performer with Kita No Taiko, Alberta’s first Japanese drum group. Ven. Samten is responsible for thanking donors who make offerings online, assisting Ven. Tarpa with developing and facilitating the SAFE online learning courses, assisting with the forest thinning project, tracking down knapweed, maintaining the database, answering email questions, and photographing the amazing moments that are constantly happening at the Abbey.